This year, Bollywood celebrities are not particularly in the mood to celebrate Holi after the sudden death of our favourite female superstar Sridevi. Last week, following the news of Sridevi's death, Shabana Azmi and Javed Akhtar had cancelled their annual Holi bash and so did several others. But several Bollywood stars have indeed shared best wishes for fans and followers on social media. "Happy Holi .. the colours of life be within you ever," tweeted Amitabh Bachchan, who also shared photos from the Holika-burning ceremony held on Thursday night. 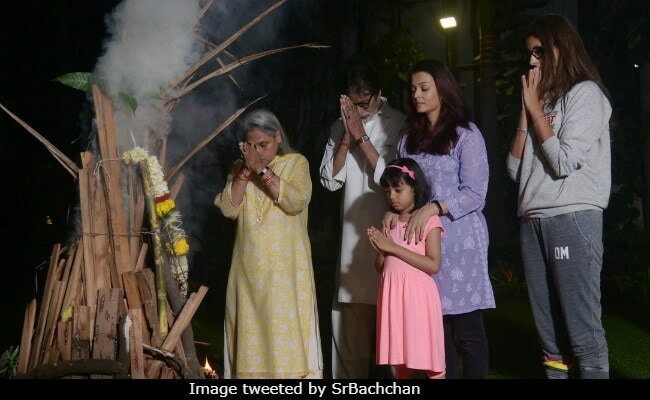 In the photos, Big B was accompanied by wife Jaya Bachchan, daughter Shweta Nanda Bachchan, daughter-in-law Aishwarya Rai Bachchan and his granddaughter Aaradhya. "The Holika has been burnt and the prayers done .. the 'tilak' colours put .. and the special sweetmeat for the occasion 'gujiya' consumed," Mr Bachchan wrote in another tweet. Priyanka Chopra, who is currently in New York for work commitments, also wished everyone a very "happy Holi" - "Happy Holi to everyone celebrating," she tweeted. "The festival signifies the victory of good over evil, the arrival of spring, the end of winter, & for many a festive day to meet others, play & laugh, forget & forgive & repair broken relationships. Wishing you a very Happy Holi! I hope you remember, No plastic balloons, okay," tweeted Juhi Chawla. Meanwhile, Ayushmann Khurranna echoed the sentiments of many as he posted a warning of sorts: "'Bura na maano holi hai' is overused and misused. Dear men, you better behave with women this time," he tweeted. Wish you a very colourful Holi, folks!